If you have a trip planned for a large group of 12 to 16 people, the most economical and cozy way to transport everyone is to rent a 16 person van. They are often listed as 15 passenger vans, because they can hold a total of 16, the sum of one driver and 15 passengers. By sharing the rental fee and fuel costs, a large group like this can make a trip for a very nominal cost per person. Is a 16 Passenger Van Worth it? This is a better way to go than a car parade of several cars, each requiring a driver, each requiring separate refueling, and wearing down several cars’ parts and over a dozen tires. A large rental van is the better way to go. You have more people to switch off driving with, there is no need to tow a trailer, so you are free of that hassle, and if you are a close-knit family, sports team, corporate group, or church group, you are always close by for impromptu group discussions and meetings while you drive. Of course, it does depend upon how many people are being transported. A group of 12 or even less may want to rent a 16 person van to also accommodate the large amount of luggage, camping gear, or sports equipment that will take up at least some of the interior space. If you find yourself in a situation where you need to haul more passengers and there is not enough space for all the personal cargo items, try to rent a van that includes, perhaps as an extra option, a large rooftop secured cargo rack. Always plan ahead to know how many people and how much luggage space is required before you rent the van. Sixteen passenger vans are somewhat more difficult to come by than smaller models and are sometimes offered as buses instead of vans. 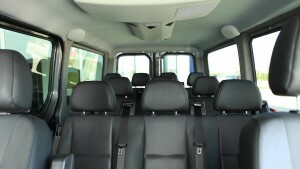 However, several companies offer sixteen passenger vans and buses that can be rented on location or online. Some of these companies include Best Bus Sales, Enterprise, Hertz, Sixt, and Avis. (Some of these locations primarily rent out fifteen-passenger vans with varying amounts of storage). Planning ahead is the key first step to such a trip. Make sure you book your van rental as far in advance as possible. These large vans are not available at every car rental company’s locations, and they are rented rarely enough that during peak national holidays, may not be available on short notice. Most of the major passenger car rental companies, such as Avis, Enterprise, Sixt Rent a Car, Empire Rent a Car also rent large passenger vans. They are also more likely to allow one way, long distance rentals, where you turn in the van to another rental office near your destination. If yours is a round trip vacation or other event, then returning the van to the location you picked it up works fine. Ideally, wherever you rent the van, see if they will give you the option of unlimited mileage. It may raise the upfront rental fee, but you might pay a lot less in total, if your trip may take unexpected and long extra side trips. As for the cost, a few years ago Avis was renting the Chevrolet Express van for about an average base rate of $80, plus about $40 in state and local taxes, making the base daily rental price: $120. If all people sharing the driving task are over 25 years of age, the rates will be cheaper. If you do not have the unlimited-mileage waiver, you will also have to pay rate per mile traveled. So, for a 3 day trip with 16 people, plus $200 for gas, you may be able to complete the trip for about $35 per person. Be sure to make sure the van and everyone on board are adequately covered by insurance, which is usually included in the rental package price. Sixteen passenger vans vary somewhat based on which company and model that customers choose. Some vans have more storage than others, and several companies allow customers to choose how much storage customers need to make the car rental experience more comfortable. Many sixteen passenger vans also include CD players and radios. Sixteen passenger vans are generally a great choice for long trips for larger families or groups of friends because they are much more spacious than mini vans, which means they are more comfortable for long journeys. Sixteen passenger vans are more expensive to rent than most cars; many cost several hundred dollars a day to rent. However, prices vary by model and location. Customers generally must be at least 25 years old to rent sixteen passenger vans, although age limits do vary somewhat based on which state customers live in, which company customers are renting their van from, and whether customers serve in the military. Fees may be assessed for younger drivers or those with a history of accidents. However, the overall process is simple, as cars can be picked up and dropped off at several locations, and because customers have many different companies to choose from.